The original Nexus 5 was has remained one of my favorite phones since its launch. It just fit in my hand so perfectly, and it was fast as hell. Still, it was crippled by truly terrible battery life, and when longer-lasting phones came along I couldn’t help but switch. The new phone is bigger than the original Nexus 5, but it’s still very comfortable to hold. It feels incredibly light. I was able to reach the far side of the screen without having to shift the phone over in my hand, though it’s still a bit of a reach to get to the very top (I wear a size large gloves, if that helps). I still kind of miss the size of the original N5, but this is very close. The brushed plastic back is nice and grippy, and it feels strong. The fingerprint sensor on the back is a real wildcard here, and for starters, it is definitely easy to access while one-handing the phone, though it wasn’t set for my fingerprint so the jury is still out on how well it will work (Google claims it works in less than a second once it learns your print well). What impressed me most, about the 5X was the speed. This thing absolutely flies. Apps pop open in an instant. Google Now On Tap, the company’s new contextual suggestion engine, works in just seconds. Once the focus is set on the camera, there’s virtually no lag at all. Finally, the animations built into Marshmallow (Android 6.0) look terrific. It’s not over the top, it just naturally fits in with the OS. The only drag that I found in my brief hands-on time with the 5X is the screen. It’s certainly incredibly sharp (423 PPI will do that), but it was a little bit washed out. This isn’t too surprising, since it’s an IPS display, not AMOLED. I guess they wanted to cut costs somewhere to keep it at $350, but still, it’s not ideal. UPDATE: The speaker is also pretty weak. Definitely pales in comparison to the dual speakers on the 6P. It’s not even close. Then I reached out and grabbed the Nexus 6P and dang, it feels great. I never loved the feel of the original Nexus 6. It always felt too big and unwieldy and I must have dropped that thing 2-3 times per week. It kind of drove me nuts. The 6P is big too, but it feels a lot better. Part of it is the gorgeous aluminum body, which brought back fond memories of the original HTC One. It also helps that the Nexus 6P is a touch smaller, bringing it closer to graspable. It’s definitely still a major reach to get to the notification drawer at the top of he screen, but I felt like I was significantly less likely to drop the thing. I will confess that it feels more premium than the Nexus 5X. In contrast to the drab display on the 5X, the 6P’s AMOLED screen looks damn gorgeous, with those deep, inky blacks and lively, vibrant colors,. At 515 PPI you’ll have more pixels than your eyeballs will know what to do with. In short, both devices really impressed me in the few minutes I had with them. They’re both fast, and they both feel great. Now I just don’t know what to do. 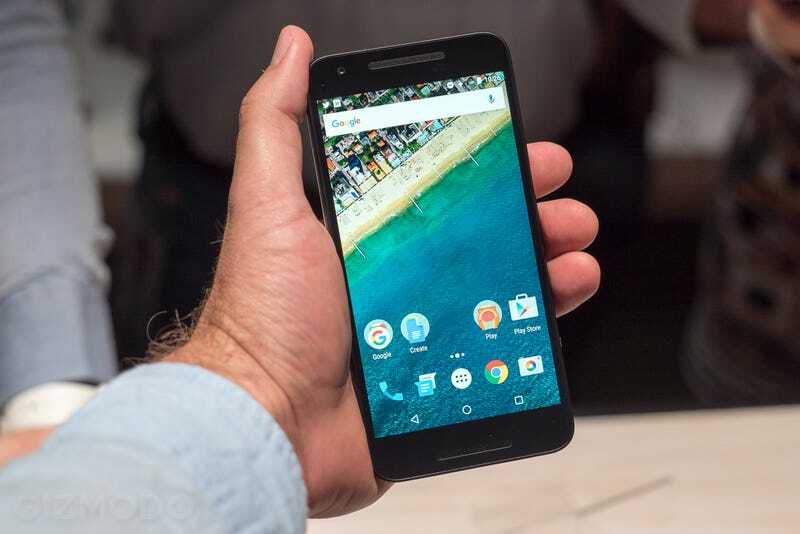 I’m drawn to the size of the Nexus 5X, but damnit if I’m not a spec-whore, which makes the 6P very hard to resist. Google says they’ll be sending out review units in the next few weeks, so hopefully we’ll be able to make a more definitive pick soon. In the meantime, regardless of which device you were excited about, you have my permission to remain excited.